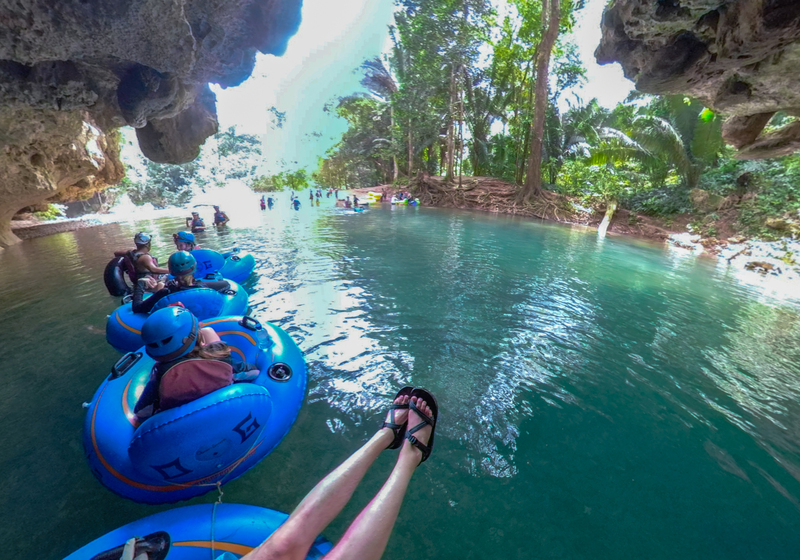 There are so many fun things to do in Belize, but cave tubing is one of the most popular Belize tourist attractions. 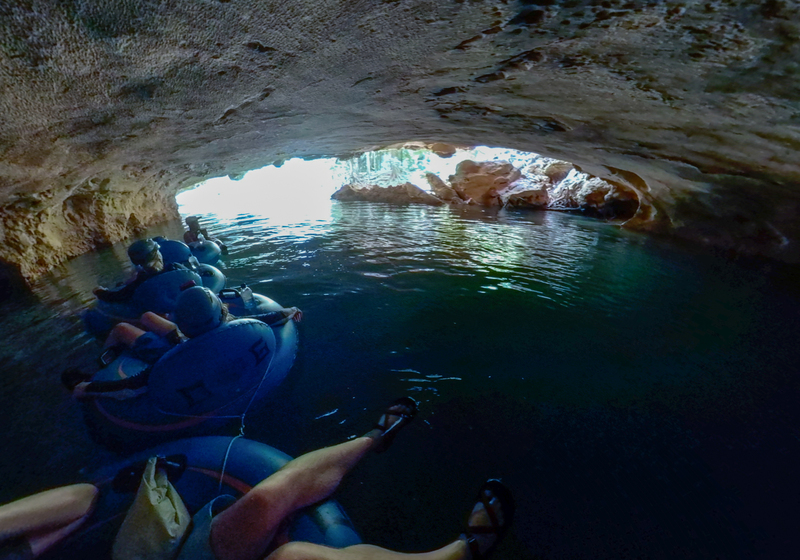 Who wouldn’t want to sit in an inner tube and float through some Belize caves? 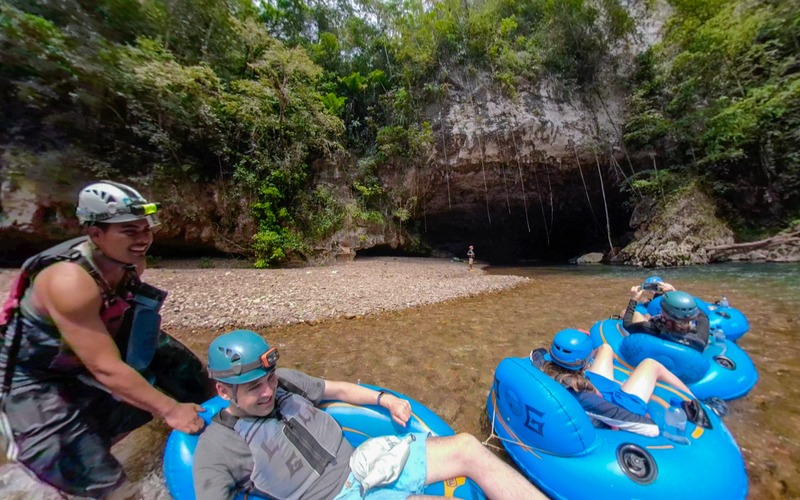 Long before we started our Belize vacation, we knew we wanted to explore a few caves via river. 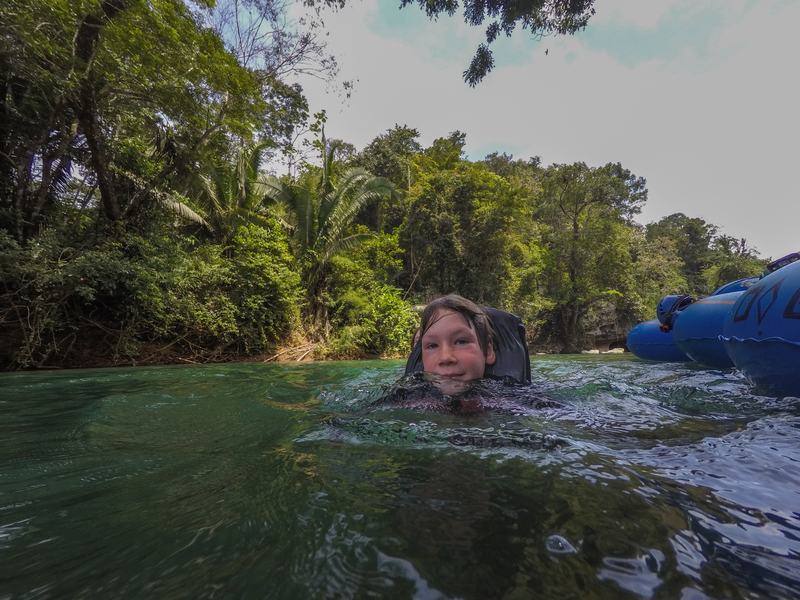 Anders asked for a Belize cave tubing trip for his birthday back in January and Big Henry and Mogie were happy to send the whole family down the river. I took some awesome photos on this trip, but my phone got wet (not here) and died. I am still hoping to rescue the photos when we get back to the U.S. and add them then. Until that miracle occurs, we have some great screenshots from the 360 video Henry took with the GoPro Fusion. We signed up for a tour with Belize Nature Travel (one of two tour agencies recommended by our friends at Table Rock Jungle Lodge). There are a lot of caves in Belize (and the whole Yucatan Peninsula) thanks to the karst landscape of abundant limestone. You can explore Belize’s caves on foot, in canoes, half-swimming, and by horseback. 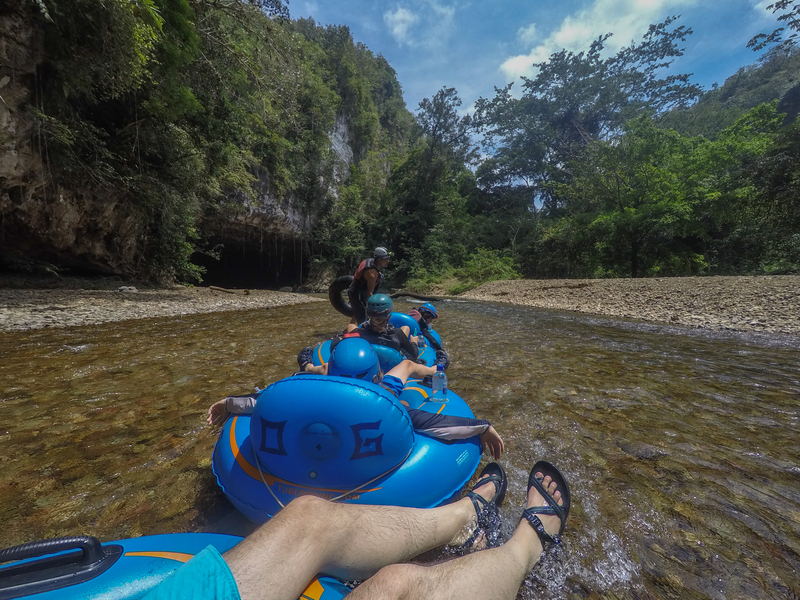 We choose to float along the Caves Branch River on inner tubes. Find the best deals and latest prices for Table Rock Jungle Lodge here. Our shuttle driver from Belize Nature Travel picked us up at our lodge and drove about an hour to Caves Branch, Belize. Tours also run from Belize City or Belmopan or pretty much anywhere else in the little country. The Caves Branch River flows through Nohoch Che’en Caves Branch Archaeological Reserve and there is a fee to enter (included in our tour). 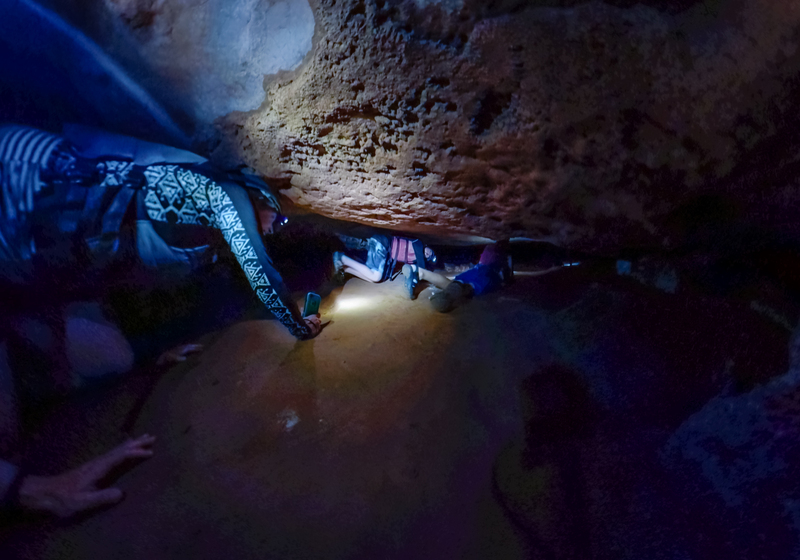 To protect the delicate cave system, everyone is required to go with a guide and each guide can take no more than eight people. We met our cave guide, Walter, at the park entrance where we found restrooms, outdoor shops with waterproof phone pouches, sunscreen, sunglasses, snacks, and handicrafts. There were also food vendors, and of course, the guiding companies doling out guides, helmets with headlamps, PFDs, and inner tubes. Fortunately, we had Walter to ourselves, and all the time in the world to explore the Belize jungle and the world underneath. We gathered up our gear and started walking along the flat trail to the put-in spot. It probably takes ten minutes to walk there, but Walter stopped every few minutes to show us something in the jungle and we spent about 30 minutes getting there. We learned about the poisonwood tree (don’t get involved with that one! ), the antidote to the poisonwood tree, all sorts of other plants…and then he ate termites. Henry and Anders gave termite-eating a shot, but I decided it wasn’t my thing. And Finn was lying in his tube on the ground protesting all the stops. I thought it was interesting. We forged the river three times on our way to the put-in spot and enjoyed the cool down. 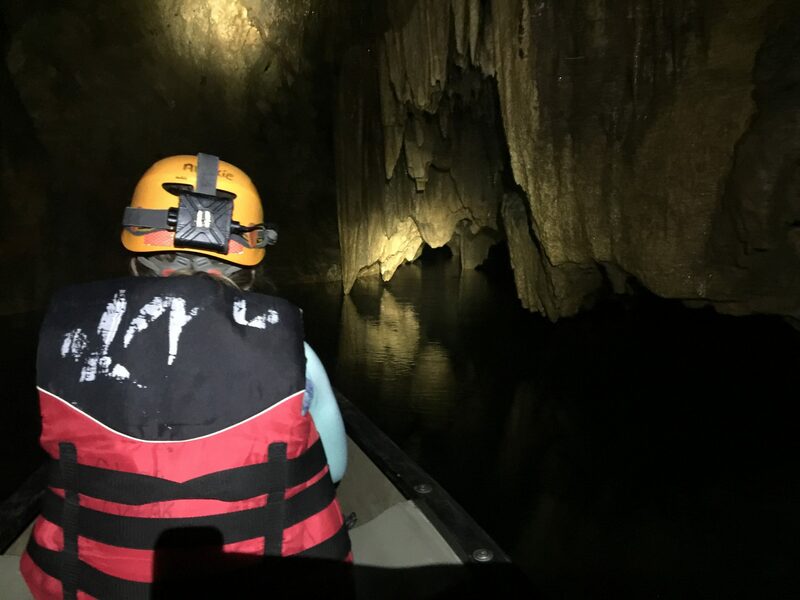 Don’t miss our adventure in the underground river in Mexico! After eating termites and a fruit of some sort presented by Walter, we reached the start of our caving adventure. We descended a wooden staircase into gorgeous, turquoise water, and gracefully, plopped into our inner tubes. Belize excursions are supposed to be all about adventure and discovery and this one was. It wasn’t, however, a high adrenaline experience (like white water rafting in Bosnia), it was more of a relaxing float in a beautiful place, which the Belize rainforest certainly is. The river was so slow that Walter had to paddle or pull us most of the way. I’ve heard that it’s a little faster when the water is higher – we were there in March, during the two-month dry season. 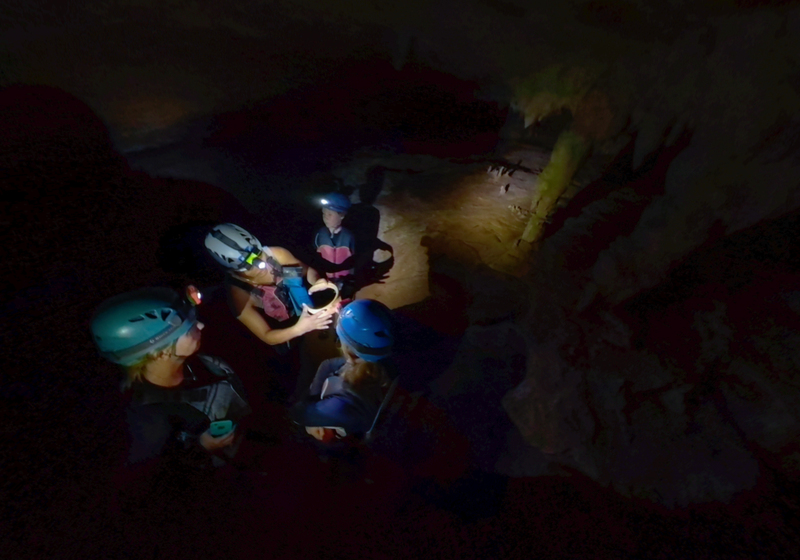 The first cave we floated through on our Belize adventure had a smooth ceiling and was about 0.5 miles long. There were a few stalactites and other cave formations, but the river occasionally fills the whole cave, disallowing the growth of formations. The farther we floated, the darker it got. Looking back at the opening we came through, framed with jungle plants, is a scene that will stick with me for a long time. Into Xilbalba (the Mayan underworld — see below) we went. I loved being in the cave. It was dark (remember, we had headlamps and could see what we wanted to see), cool, and relaxing. I was happy to hang out there all day. 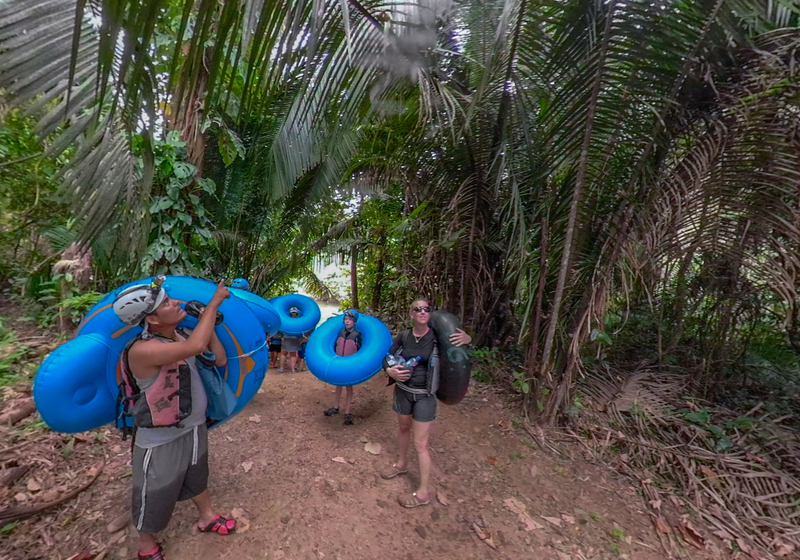 We then popped out of the cave and floated through the jungle for a little bit before reaching the spot where most Caves Branch tubing participants get into the river. It got a little busier, but not too bad as we entered the second cave, this one 1.5 miles long. In the second cave, Walter offered to take us up higher in the cave. This involved climbing up some muddy rocks and then squeezing through a hole. We were definitely interested in that (and we still have the red cave mud on our swimsuits to prove it!). He pulled us over to the side of the cave and we scrambled up toward the ceiling. Crawling through the hole wasn’t too bad, especially for the kids. The bigger you are, the tougher the army crawl was. And we were still wearing life jackets and helmets. I had to ask Henry if I looked as cool as I felt. As the biggest member of our party, he was working too hard to notice. Walter showed us some pottery pieces left by the Maya, which was really amazing. It’s just sitting in there. We also got a close up look at the tiny insect bats sleeping in holes in the ceiling of the cave. They were adorable. Can you believe we fit through there? Then we crawled through another skinny section to a natural balcony overlooking the river. Groups of headlamps floated by as we made spooky sounds to scare them. I’m sure that wasn’t mentioned on their Belize river tubing brochure, but the kids sure thought it was fun. Back in the tubes, we floated under more bats, stalactites, curtains, columns, and other cave decorations. We started hearing a great rushing of water and figured another stream must be coming into the cave. It turned out to be a long, waterfall flowing over a ledge of calcite. It was beautiful. I’d show you if I could get my photos. This was one of my favorite parts of our Belize river tubing trip. We exited the cave and floated another fifteen or so minutes to the take-out. There were a few shallow parts where Walter would warn us to get our “butts up” to avoid scratched derrières and deeper spots where we could hop out of our tubes and swim. We even found a vine that the kids attempted to use to swing into the river Tarzan-style. It was about a two-minute walk back to entrance, Santiago, and our delicious lunch. Finn said it was one of the best lunches he’s ever had (that may be because of the mini-Snickers, but he ate two veggie-filled tortillas). The Maya believed that rivers were the route to the underworld or Xibalba. For them, the underworld was more like a hidden realm than a “hell.” Cenotes and rivers could provide access to the great network of rivers beneath the surface where their gods lived. There were celestial gods, too, but these were accessed differently. The Maya made offerings and sacrifices in many of the caves in the region. They weren’t limestone tubing, of course, they would walk/wade/swim into the caves. As a severe drought persisted, they made more and more sacrifices in a desperate attempt to encourage the gods to make it rain. In a lot of the caves, especially the ATM cave, you can see the bones of the sacrifice victims. We did a lot of fun things in Belize and cave tubing was one of the best. If you get a chance to go while you are there, definitely get in touch with Belize Nature Travel to help set up your Belize adventure vacations. Looking for other things to do in Belize? We found this to be one of the best Belize tours, but there are other options out there. Belize cave tubing and zipline combination, ATM tour Belize, Belize Mayan ruins and cave tubing combo, and other Belize adventure tours are offered by Belize Nature Tours. 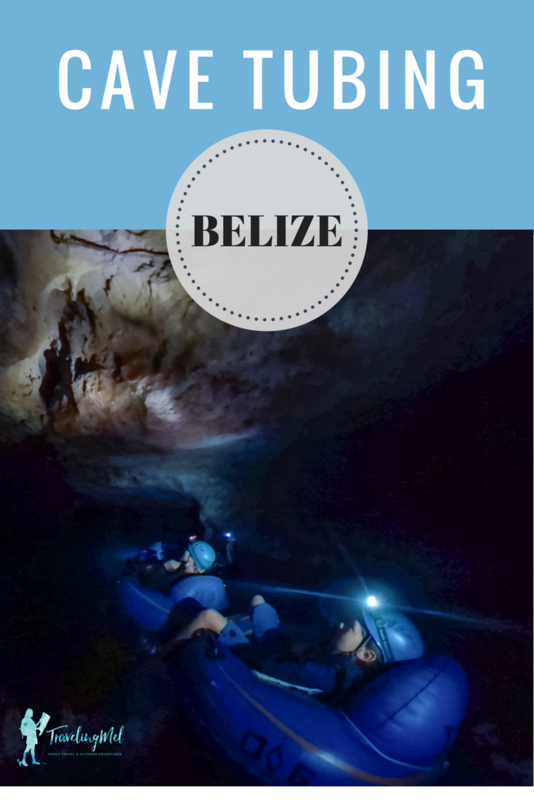 As their website says, “Luis Godoy is a certified cave guide and has guided individuals and groups through many of Belize’s spectacular caves. He has participated in cave mapping and exploration. He is actively involved in cave conservation. He has a close relationship with the Belize Archaeology Department which officially manages the caves of Belize.” Just the person you want leading your cave excursions. ATM Cave Belize is probably the most well known cave and another of the popular tours in Belize. Our friends, the Broberg-Carpenters, were in Belize the same time we were. Half the family, Drew and Henry (10-years-old), found this to be a grand adventure. It’s a 10-12 hour day hiking through the jungle, then walking/wading/swimming through the cave. You enter a sacrificial chamber and see the bones of a teenage girl who was sacrificed there. Nora exploring Barton Cave via canoe. The other half of the Carpenter family, Christine and Nora (8-years-old), went canoeing in Barton Creek Cave. 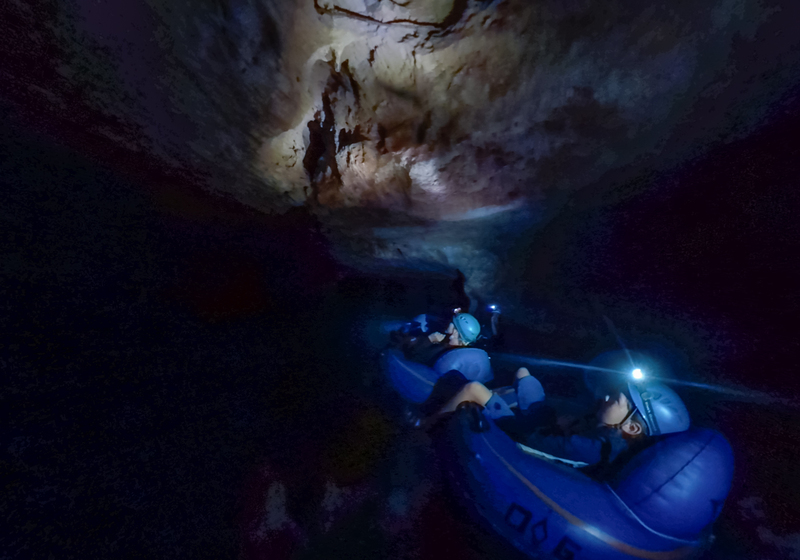 This is another great way to explore Belize’s caves. The cave zipline is at the same place as you start the tubing tour so it’s easy to combine the Belize zipline and cave tubing excursion. We saw a few people zipping through the trees and across the Caves Branch River as we were getting out of our inner tubes. It looks really fun. We decided not to go ziplining in Belize only because we are going to try to make that happen in Mexico. We have to spread the excitement out a little. 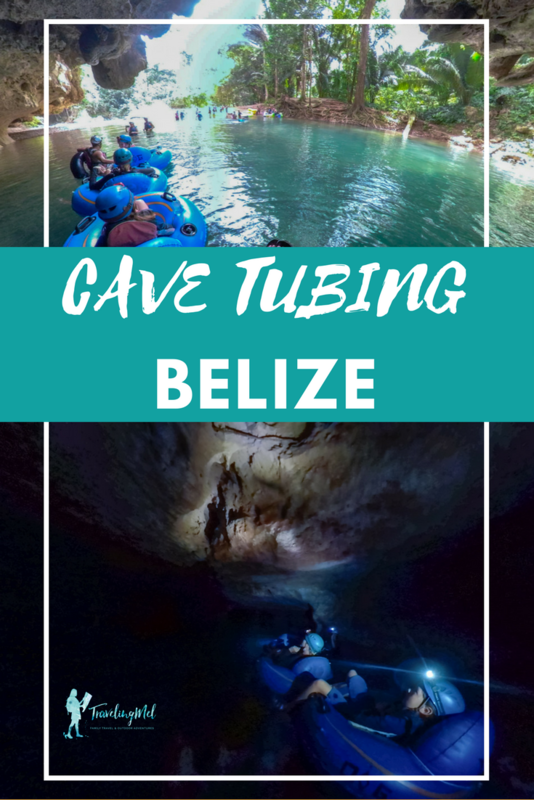 Thanks to Belize Nature Travel for the discount on our cave tubing. The opinions expressed here are my own, of course. what a wonderful adventure!! I always enjoyed and rafting experiences and the caves in Thailand. I still have the picture of our family and Nila’s family rafting on the Colorado River. That was a fun trip!